After almost a decade of limping growth, the significant recovery of the global economy as well as that of the Global Steel Industry in 2017 also points to a favourable outlook for the Indian steel industry. There is no question in the minds of the international community that steel consumption is bound to grow in India, for it is clear that the present generation already demands a better quality of life and the next generation certainly will. This is because the level of consumption of steel is known to be one of the key indices for measuring the quality of life. After almost a decade of limping growth, the significant recovery of the global economy as well as that of the Global Steel Industry in 2017 also points to a favourable outlook for the Indian steel industry. While global production of crude steel at 1,691 million tonne (MT) noted a growth of 5.3 per cent in 2017 over the previous year, the estimated steel consumption rose to 1,622 MT. The latest Internal Monetary Fund projection has estimated the global economy is slated to grow at 3.9 per cent in 2018, and India's GDP is to move up by 7.4 per cent in 2018 as compared to 6.7 per cent in the previous year. The continued growth in GDP in India, in fact, indicates that major steel consuming segments such as construction, real estate/housing, capital goods/machinery, consumer goods, automobiles and energy sector shall benefit. The housing and construction sector, where major chunk of steel is consumed, shall get a boost with increase in per capita incomes and social sector schemes like Pradhan Mantri Awas Yojna-Housing for All, Sardar Patel Urban Housing Mission, 100 Smart Cities Mission (by 2022), Pradhan Mantri Gram Sadak Yojna, Urban Infrastructure Development Scheme for Small & Medium Towns (UIDSSMT), National Heritage City Development and Augmentation Yojana (HRIDAY), Bharatmala project, 24x7 Power for All initiative (by 2019), Development of Industrial Corridors & National Investment & Manufacturing Zones, 75,000 MW Clean-Energy initiative (by 2022) and many others. In a nutshell, with the increasing thrust on the "Make-in-India" vision by the Indian Government under the leadership of Prime Minister Narendra Modi, the Indian steel industry itself will grow and will be in a position to supply the required quantities and grades of steel much needed by the end-users. This also given the fact that the per capita finished steel consumption remains at a dismal 60 kgs, in contrast with the world average of around 220 kgs. 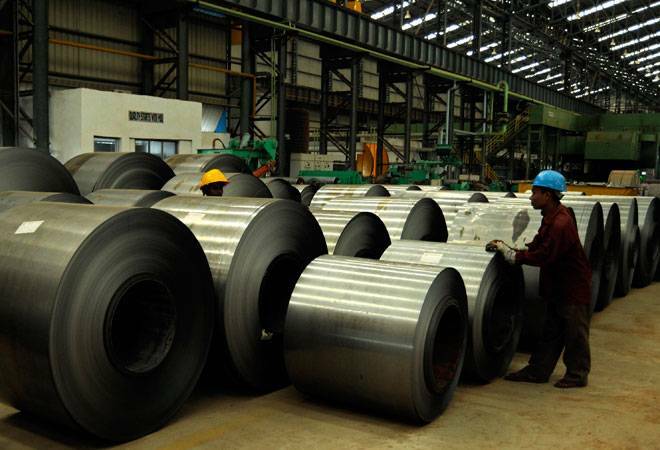 The recently formed Global Forum on Excess Steel Capacity has acknowledged India's capacity expansion of steel as a function of growing consumption in the domestic market. In spite of clear signals of recovery today, it is important to keep in mind challenges of the past that plagued the industry. Over the past few years, the global steel industry has been reeling under the pressure of overcapacities, especially on account of those existing in China. With the growth in steel consumption slowing down in China in recent times, the Chinese steel producers have had no option but to rely on exports. This in turn has had an impact on high growth centres of steel consumption in "steel-non-mature" nations such as India. Additionally, depreciation of major currencies has led to a spurt in export by several countries like Russia and Ukraine. It was for these reasons that India saw an influx of imports beginning 2014-15 from several countries, including China. The surge in imports impacted the sentiment of the domestic steel market, with declining capacity utilisation rates of both the primary and secondary steel players. Additionally, erosion of margins, coupled with sluggish demand growth, made the Indian steel investors wary of returns on their investment. However, the Government of India came out proactively to provide a level playing field to Indian companies through imposition of anti-dumping and safeguard duties as well as minimum import prices, wherever injury to the industry was noteworthy. Given the recent imposition of tariffs by the United States as an outcome Section 232 investigation of the Trade Expansion Act of 1962, the "steel-mature" countries like China, Japan, South Korea, etc. will look at India with immense interest. The Indian Steel Association has continued to highlight the long term distortions that such high level of cheap imports bring into the domestic market. Under the new global circumstances that pervade the trade scenario, imposition of Quality Control Order(s) is a step in the right direction by the Ministry of Steel to control imports of seconds and defectives into India, which jeopardise the safety of the Indian end-consumer. The Indian Steel Industry continues to grapple with uncertainties pertaining to the availability and consistent supplies of raw materials i.e. both coal and iron ore still remain a challenge, with recent closure of mines in Goa adding to the woes of the industry. Even though the marked shift from an allocation process to an auction process of getting mining blocks has brought about considerable transparency; issues pertaining to transport logistics from the mining areas need to be sorted out to mitigate lag in evacuation of iron ore, coal and other minerals. Indian Steel Association has identified that "handholding" from the various state governments in such matters is very essential and has embarked upon bringing such issues to the attention of state government authorities, beginning with Odisha. Additionally, the resolution process of debt ridden steel companies currently underway at the NCLT shall necessitate a marked change in the structure of the industry. In spite of the threat of imports, Indian steel enterprises invested hugely into modernisation and expansion of their existing units as well as green-field plants to build a world class, cost competitive, environment-friendly and socially responsible industry. This is in line with the objectives of the National Steel Policy 2017 to increase the Per Capita Steel Consumption to 160 Kgs by 2030-31 from the current 60 kgs. This will necessitate a steel capacity of the tune of 300 MTPA from the current 128 MTPA. The Indian steel industry is fully geared for this, alongside stressing on remaining competitive. This can be substantiated from the fact that as per the list of 'World Class Steel Makers in the World' released by World Steel Dynamics in June 2017, 36 steel makers were classified as World Class Steel Makers out of more than 250 large steel makers in the world. Within the list of 36, six Steel Makers from India namely JSW Steel, SAIL, Tata Steel, JSPL, RINL & Essar Steel qualified as World Class. The steel industry is capable of achieving much more alongside contributing to public cause, as an increasingly enabling policy environment is provided by the Government.